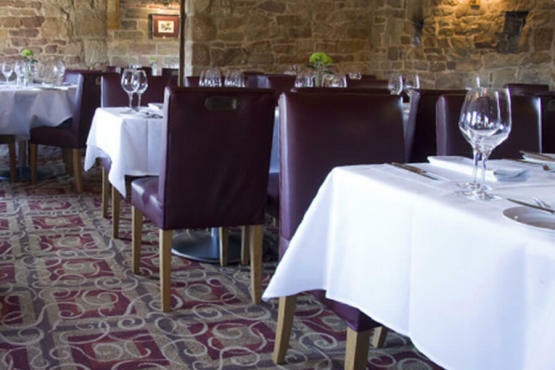 Restaurant carpet cleaning is easily overlooked but crucial! Most restaurants have heavily patterned carpeting for a reason—a multitude of colors and a jumbled design are great camouflage for areas that are prone to soiling. No matter how much mud gets tracked in or how much food the diners drop, the patterns and colors in the carpet help mask the stains and make them harder to spot. Overlooking heavily soiled carpets can lead to carpeting that grows mildew and mold, gives off unpleasant odors, and harbors bacteria that can affect the health of both your customers and your employees. It is no secret how restaurant carpeting is especially prone to stains and soiling. It all begins with Grease. Any amount of cooking with oil causes microscopic drops of grease to be suspended in the air. This grease floats around your restaurant, and some of it will eventually migrate out into the dining room and settle on the carpeting, your wait staff will track it from the kitchen to the dining room on the bottom of their shoes. This greasy residue is both a magnet for dirt and a food source for bacteria, and the longer you leave the carpeting unclean, the worse the problem becomes. On top of the grease residue lies the results of hundreds of diners using your restaurant. Dressing gets dripped near the salad bar, drinks get spilled in aisles and under tables, and children drop food on the floor. The result is a large, moist mess that adds to the bacterial growth, making the odor problem even worse. After a surprisingly short period, this stops being a cleaning problem and starts being a financial one, as customers will stop showing up when your dining room smells like mildew. The only way to successfully clean your Restaurant is with the proper tools and chemicals. If you apply the wrong chemical it will leave lots of residue in the carpet, which leads to rapid resoiling. Once the carpets has been restored by power brush agitation and hot water extraction, an encapsulation system can be incorporated on a monthly basis. This interim cleaning method can save the budget and keep the carpet in a continuous high state of appearance.